This beautiful, elusive animal is the largest cat species. It’s hard to mistaken them – tigers are known for their thick reddish coats with white bellies and white and black tails. Their stripes are special to each individual, and the tails keep them balanced. You also won’t mistake the mighty (and even rarer) white tiger. 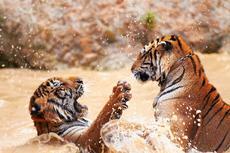 It is variant of the Bengal tiger, which is found in the wild in several Indian states. Some tigers live where it gets very cold—in India and parts of Southeast Asia. After a century of decline, tiger numbers are on the rise. At least 3,890 tigers remain in the wild, but much more work is needed to protect this species that’s still vulnerable to extinction, according to World Wildlife Fund. Tigers have been overhunted for their fur and body parts that people use in traditional medicines. Tigers' habitat has also dwindled seriously as humans have developed land for uses such as farming and logging, according to National Geographic.